Unlike the last downturn, large Chinese solar companies such as Canadian Solar, JA Solar, Hanwha Q-Cells and Jinko Solar have reported stellar results with gross margins in the mid teens level. This is in sharp contrast to the Taiwanese and western companies that are reporting large losses. A global manufacturing and sales footprint, low costs and downstream capabilities have allowed the companies to weather this downturn in a much better manner, as compared to the last downturn during 2012. This time only the smaller companies and those with high cost structures are getting hurt. Even the revenues and margins have not been affected much. These companies have reiterated a guidance of keeping 5-7 GW of modules shipment each in 2016, despite a sharp cut in Chinese demand. While the smaller Chinese companies are hurting, these companies continue to expand capacity and production gaining marketshare from others. Each of these large players now have a 10% global marketshare with decent sustainable margins. While prices have corrected sharply, these companies have not been affected that much as they are able to sell more in the higher price regions such as USA and Japan. Their costs have also come down sharply with Jinko Solar reporting costs of around 35 cents/watt for their inhouse manufacturing. I think that the winners have chosen themselves and they will come out much stronger from this downturn. It looks unlikely that other crystalline solar panel players will be able to unseat these companies. Unless some dramatic technology changes happen, I think these will be the long term winners in the solar industry. Good time to take a position in these stocks, most of which are traded in the USA stock exchanges. The Taiwese companies again face questions about their business model and long staying power in this industry. 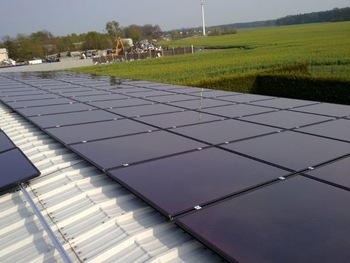 These companies have not managed to become successful end to end manufacturers, being dependent on other solar panel companies to buy their products. Most of them are cell manufacturers and get inordinately squeezed during these times of overcapacity. Gintech which is one of the largest and most successful solar companies in Taiwan reported a whopping negative gross margin of 104% during the third quarter. Solar cell maker Gintech Energy has reported consolidated revenues of NT$2.167 billion (US$68.7 million), gross margin of -104.93%, net operating loss of NT$2.537 billion, net loss of NT$2.562 billion and net loss per share of NT$5.71 for third-quarter 2016.